Dhaka, Aug 10 (Just News): Dr Kamal Hossain and the outgoing US Ambassador to Bangladesh Marcia Bernicat of hatching a conspiracy to topple the present government, said Law Minister Anisul Huq on Friday. The minister said these while addressing a rally marking National Mourning Day at Kasba Mulgram union in Brahmanbaria in the morning. “Dr. 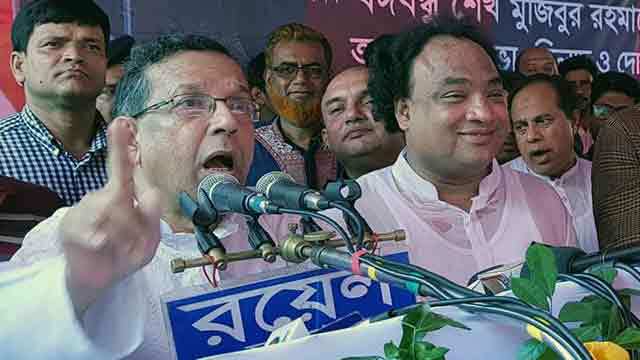 Kamal Hossain is hatching a conspiracy along with the Americans to destabilise the government, and are engaged in plotting a new conspiracy even after the Prime Minister agreed to meet all the students’ demands”, the minister said. Anisul said BNP-Jamaat and their cohorts tried to topple government by inciting the recent movement of the students. ‘Recently the students took to the street after the sad death of two students in road accident. They had demanded for Road Transport Act and the cabinet has already approved the draft as part of accepting their demand after giving support to their legitimate movement,’ he said. ‘The next general election will be held in December. But BNP-Jamaat and their cohorts are trying to make the election commission disputed by raising ridiculous allegations like the polls will not be fair,’ he added.